Where does magic come from? Oh, sure, there's a wizard in your party, but why does he get to shoot fire from his fingertips while you're left holding a heavy sword? How come the lady mage in a glorified tank top and cloak gets to summon a giant fire elemental while you're stuck sweating in your armor? What makes them so special? The answer varies from game to game. Older games that prioritized action hand-waved magic as simply something wizards do. Modern games, by contrast, usually incorporate a team of writers eager to add substance to their world by inventing explanations for magic's existence. Final Fantasy VII channels magic through materia, the planet's life force crystallized into convenient little jewels. 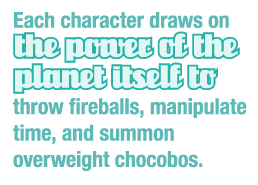 With materia equipped, each character draws on the power of the planet itself to throw fireballs, manipulate time, and summon overweight chocobos. All characters can equip materia to their weapons and armor to immediately gain benefits that would require heavy dedication in other games. Rather than studying for years, a character simply goes to a store and purchases a little orb that gives them the ability to channel planetary power. The Materia System pulls players directly into the game's conflict between convenience and sustainability. Outside of a few rare exceptions, most materia is created through an industrial process that literally drains the life of the planet. The main characters in Final Fantasy VII begin the game as a band of eco-terrorists who blow up reactors and fight a guerilla war against the corporation responsible for converting the planet's life force into quarterly earnings. Both the players and the characters enjoy an easier life as a result of the materia system, so players are more likely to sympathize with the protagonist's moral dilemma of utilizing the tools that kill the planet in order to save it. This sympathy would be a lot harder to create if players had no personal benefit from the eventual destruction of the planet. By contrast, Eternal Darkness: Sanity's Requiem crafts a magical system that provides great power at great immediate cost. Alexandra Roivas stumbles across the titular Tome of Eternal Darkness while investigating her murdered grandfather's mansion. The tome is a charming book of unspeakable horrors bound with human bones and skin, so naturally Alex opens it and begins thumbing through the stories contained within. She discovers a nearly 2000-year conflict between four godlike Lovecraftian horrors. Each chapter of the game takes place in a different setting as Alex reads the adventures of tome's previous owners.